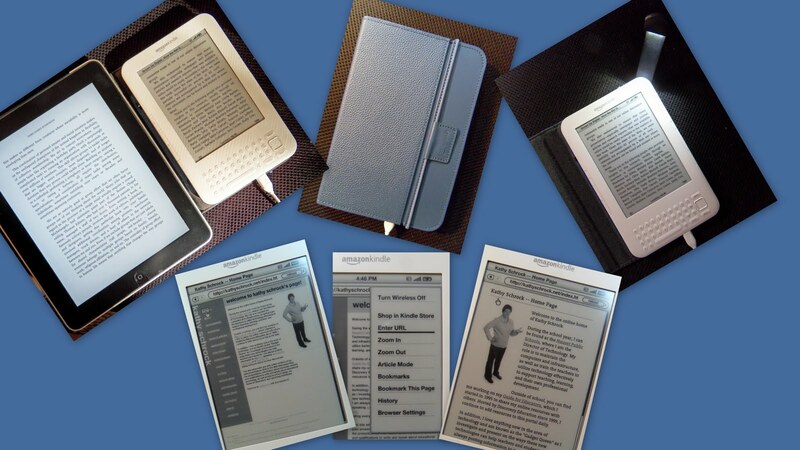 Kathy Schrock's Kaffeeklatsch: The Kindle 3 is kool! My first impression of the Kindle 3 is wow! As an early adopter and heavy user of both the Kindle 1 and 2, I am really impressed with the updates! The device is smaller (7.5" x 4 7/8"). The device is light (weighed it on my postal scale: 8.3 oz.) The page turns are as quick as lightning! The screen is more readable. You can highlight a passage from anything you are reading and share it via Twitter or Facebook. A photo of the iPad and the Kindle together to demonstrate size. The new Kindle cover with a built-in light. It weighs almost as much as the Kindle itself (7.8 oz.) which brings the total weight of the Kindle and this case to a tad over 1 pound. The new case with the built-in light is very well-done, though! You hook the Kindle in the case via two small metal hooks that go into small slots (that must create the circuit) on the left side of the Kindle. Then you simply pull up the upper right-hand corner of the case and a rigid plastic strip with a bright light comes out, and turns on to light up the Kindle screen. The light gets its power from the Kindle, so I will have to do some testing to see what the battery drain is like when using the light. But it works great in the dark! The experimental Web browser now shows Web pages in their native form. This is the shot of my Web page when typing in the URL. The pop-up menu for the experimental browser allows you to zoom in on the page to make it readable, bookmark the page, or access your previously bookmarked pages. This pop-up menu even has an "article mode" which reformats the Web page for easy reading as seen in the last image. The changes are all good on the new Kindle, and, if you have been holding off, I think this is the time to get one! Of course, you should compare all the other models on the market, too, but I am partial to the Kindle because of the large digital library of choices and the fact that the electronic ink and non-backlit screen allows me to read for a long time without tiring out my eyes! Anybody else get the new model? Please leave your comments below and share your thoughts!